SYZYGY™ Spine Stabilization System by Amendia Inc. This critical addition to our line of lumbar fixation products will provide another way for surgeons to evolve and innovate their care. 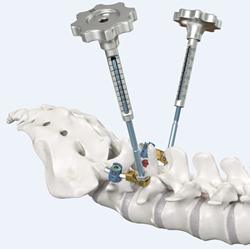 Balanced spinal solutions provider Amendia Inc. is pleased to announce the commercial launch of its innovative Spondylolisthesis reduction system:, the Syzygy™ Stabilization System. Configured to provide immobilization and stabilization of spinal segments as an adjunct to fusion, Syzygy is ideal for use in the treatment of specific acute and chronic instabilities or deformities of the thoracic, lumbar, or sacral spine; and conditions such as fracture, dislocation, scoliosis, kyphosis, spinal tumor, or failed previous fusion. The Syzygy Stabilization system is part of Amendia’s growing list of products for balanced solutions for lumbar fixation systems. To learn more about Syzygy, including features and benefits and 510(k) information, please visit us at http://www.amendia.com. Headquartered in a state-of-the-art manufacturing facility in Marietta, GA, Amendia is a leading designer, developer, manufacturer and marketer of medical devices used in spinal surgical procedures. Amendia’s mission is to exceed surgeon and patient expectations by creating balanced solutions with disruptive technologies for medical devices paired with biologics and instrumentation. Amendia’s vertically-integrated strategy focuses on improving surgical outcomes and the lives of patients with spinal disorders. For more information, please visit http://www.amendia.com.